Srdecne vas zveme na 12. rocnik Adventnich geoskorapek - opet na oblibenem miste u Certovky pod Karlovym mostem. Spolecne si pripomeneme predvanocni lidove tradice - pousteni plovoucich svicek po vode pro stesti. Jedna se o setkani s kacery, kacerkami, kacercaty, prateli, znamymi a vsemi dalsimi. V nekonecne skupine všech pritomnych bude zcela jiste prijemne zase videt sve „stare“ zname a urcite bude i dost casu na seznameni se s nicky, ktere zname zatim jen z logbooku. Potom se muzete projit treba na Karluv most, pripijet si na blizici se Vanoce a divat se na krasy Prahy osvetlene nasimi lodickami. Muzete se take vydat hledat 10 megaeventovych LAB kesi do okoli. Pojdme tedy, zastavme se na chvili a rozsvitme svetla na nasich lodickach v tomto predvanocnim case. Prosime, prineste si lodicky jiz predem vyrobene, jenom z prírodních materiálu (zadny plast, lodicky konci ve Vltave), zapalky nebo zapalovac a nezapomente na sklenicku pro sebe a cleny sveho teamu, a nejaky napoj vhodny k jejimu naplneni (myslete i na sve deti :). Ostatni kaceri take oceni, nabidnete-li jim vanocni cukrovi, placatku nebo jinou specialitu. Pred samotnym megaeventem se bude konat setkani zajemcu o vymenu CWG v parku Kampa na souradnicich N 50°05.021, E 14°24.450, v case 16:00 – 17.00 pod zastitou Komety. Samotne vypousteni skorapek zacne v 17.00. Diky spolupraci s Muzeem Karla Zemana a Prazskymi Benatkami mame letos opet k dispozici vsechny tri useky mola u Certovky. Provoz na molu bude jednosmerny – na obvyklem miste na uvodnich souradnich sejdete po schodech k Certovce, na molu vypustite skorapky a jina geoplavidla a po molu budete dal pokracovat na jeho konec, kde po prave strane po schodech vyjdete na Sasky dvur, kde se nachazi Muzeum Karla Zemana. U muzea muzete vyuzit slevu 25 procent z ceny na prohlidku muzea (heslo SKORAPKY - sleva plati cely den konani akce) nebo pokracovat dal zpatky k úvodnim souradnicim. Kocarky a psy pohlidame u schodu na molo. Objednane geocoiny budeme vydavat primo na souradnicich eventu v prubehu celeho megaeventu. K dispozici budou taky CWG (2 verze, standardni cena 10 Kc za 1 CWG). Prodavat budeme take SQ, taky za 10 Kč. Nepiste do logu zajem o CWG a SQ, rezervace z kapacitnich a organizacnich duvodu nebudeme delat, pokusime se zabezpecit dostatecne mnozstvi, ale nezarucujeme, ze se dostane na kazdeho. Nejdrive k samotnemu vypousteni skorapek: Zaciname v 17.00, letos opet diky spolupraci s Muzeem Karla Zemana a Prazskymi Benatkami mame k dispozici vsechny tri useky mola u Certovky. Provoz bude letos jednosmerny – na obvyklem miste na uvodnich souradnich sejdete po schodech k Certovce, na molu vypustite skorapky a jina geoplavidla a po molu budete dal pokracovat na jeho konec, kde po prave strane po schodech vyjdete na Sasky dvur, kde se nachazi Muzeum Karla Zemana. U muzea muzete vyuzit jeho nabidky popsane nize, na nadvori bude také jeden ze dvou logbooku a stul s prodejem CWG a geocoinu, nebo muzete pokracovat dal zpatky k úvodnim souradnicim. Kocarky a psy pohlidame u schodu k molu. Vyroba plavidel - prosime, poustejte jenom plavidla vyrobena z prirodnich materialu. Geoskorapkovy eshop na adrese http://geoskorapky.kesky.cz/cs/ bude otevren do ctvrtku 7. prosince 2017. Zajemci si mohou zakoupit tematicke geoskorapkove geocoiny, po tomto datumu jiz bude mozne zakoupit je jenom na miste. V ramci megaeventu si muzete odlovit 10 lab keší. Zacit hledat muzete v nedeli 10.12.2017 od 16.00 hodin do jedne hodiny ranni nasledujiciho dne. Logovat je pak muzete 10 kalendarnich dni. Hledat a logovat muzete na adrese: https://labs.geocaching.com/goto/skorapky2017 prostrednictvim vasich chytrych telefonu online nebo pak pozdeji na pocitaci. Tematem lab kesi jsou vanocni pisne a provedou vas ulickami Male Strany až pod Petrin. Doporucena trasa jejich odlovu je podle cisel pisnicek, na kazde „labce“ (gramodesce) najdete kod k jejimu odemknuti. Jeden logbook a stul s prodejem cwg a volnych megaeventovych geocoinu bude v Saskem dvore, druhy stul s prodejem cwg, prodejem volnych geocoinu a vydejem prodanych geocoinu a druhy logbbook bude v blizkosti úvodních souradnic u schodu k Certovce. Muzeum Karla Zemana, partner megaeventu, Vas zve cely den 10.12. na prohlídku muzea. Pri vysloveni hesla Geoskorapky mate v nedeli slevu 25 procent na vstupne. Muzeum je otevreno od 10.00. do 19.00 (posledni vstup od 18.00). V predsali Muzea (mimo arealu se vstupnim se muzete vyfotit na Steampunkovem fotorobotovi nebo natocit kratky film na zelenem pozadi. Na nadvori muzeum nabizi take obcerstveni. 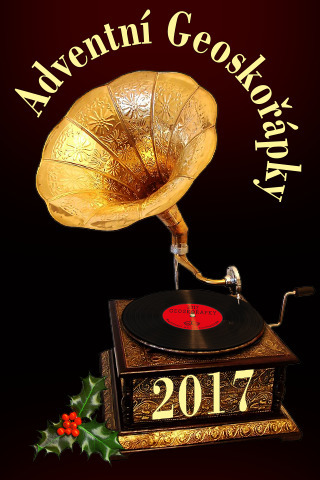 Za organizatory 12. rocniku Adventnich geoskorapek se na Vas vsechny tesi Saman a vojrou (který se letos bohuzel ze zdravotnich duvodu poprve nemuze zucastnit). Join us in Advent Time to celebrate approaching Christmas holidays. We will meet for the 12th time near Certovka channel in Prague close to Charles Bridge. Each participant should bring a small boat (e.g. from a nut shell) with a candle light. We will let the candle boats float in Certovka channel and then watch all together this spectacular show. Historical buildings illuminated by hundreds of candle lights, happy children, new and old friends around and small gifts being exchanged create an unforgettable atmosphere. Do not forget to bring some Christmas food and drink and share it with fellow geocachers.Geonutshells is a traditional Christmas event that takes place every year (from 2006) in mid December. Although by design it is a simple event, spontaneously it grew into a megaevent because in last 8 years more than 500 nicks (> 1000 individuals) attended each event. 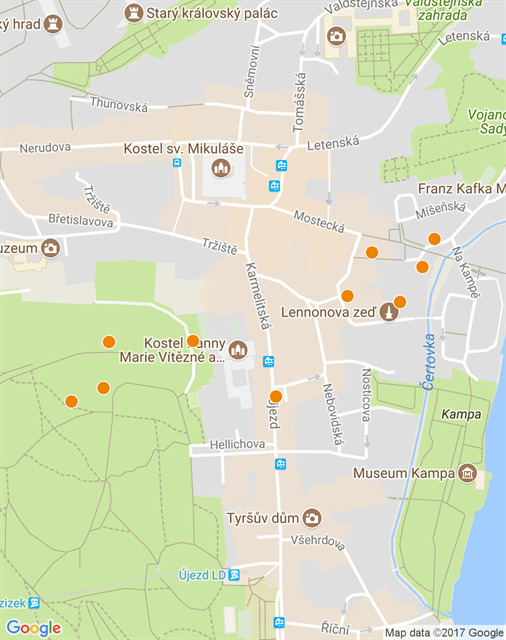 Geocacher Kometa invites you to meeting of persons interested in exchanging Wooden Geocoins in Kampa park on the coordinates N 50°05.021, E 14°24.450 nearby the Megaevent site, in time 16:00 - 17:00 (before the megaevent). LOGBOOK, sale of Czech Wooden Geocoins, SQ, sale and dispensing of ordered Geocoins and ordered T-shirts: There will be two Logbooks, one bit from the initial coordinates and second one in the middle of the Saxon court at the Museum of Karel Zeman, which is the partner of Megaevent. Selling of CWG (2 species) and SQ will take the Saxon court, the other table with CWG, SQ, and geocoins will be near introductory coordinates. You can pick up ordered geocoins at the published coordinates throughout the mega-event. You can buy CWG (2 versions, for 10 CZK for 1 CWG). You can buy also SQ, also for 10 CZK. If you have any questions about the megaevent, write the personal message to the owner. First of all, the start the megaevent: We start at 17.00, this year we have all the three moths of Certovka available, thanks to Karel Zeman Museum and Prazsky Benatky. This year's traffic will be one-way - on the usual route you will go down the stairs to Certovka, drop off the nutshells with candels and other geoboats and take the end of the pier to the end, where you will go to the Saxon courtyard where you can find the Karel Zeman Museum. At the Saxon yard museum, you can use his quotes to describe his name, and one of the two logbooks and the CWG and geocoin sales, or you can go back to the initial coordinates. Dogs and dogs are looking at the stairs to the pier. Production of geoboats with candle - please, please made them only of natural materials. Megaevent eshop at http://geoskorapky.kesky.cz/en/ will close in the Fourth of December 7, 2017. You can purchase the Megaevent geocoin , after this day it will be possible to buy them only on the spot. In the megaevent, you can search for 10 lab caches. You can start searching on Sunday, December 10, 2017 from 4:00 pm until 1:00 am the following morning. Logging can then be 10 calendar days. Find and log on at https://labs.geocaching.com/goto/skorapky2017 through your smartphone online or later on the computer. The theme of lab caches are Christmas songs and they make you through the streets of Mala Strana below Petrin. The recommended route for catching them is according to the number of songs, at each "lab cache" (gramomphone record) you will find a code to unlock it. One logbook and table with the sale of cwg and megaevents geocoin will be in Saxon court, types of cubs selling cwg, selling geocoin and delivery of sold geocoins, and the additional logbbook will be near the initial coordinates at the Certovka staircase. Karel Zeman Museum, Partner of MegaEvent, invites all day 10.12. on the tour of the museum. When you say "Geoskorapky" password, you have a 25 percent discount on your ticket on Sunday. The museum is open from 10.00. until 19.00 (last entry from 18.00). In the museum, you can take a picture at Steampunk's photobook or take a short film on a green background.